The new Pew Global Attitudes survey shows that President Barack Obama is popular in much of the world, and is consistently more popular than his predecessor, George W. Bush. 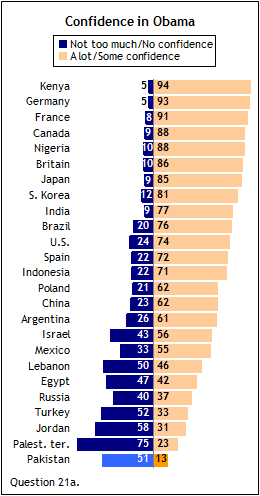 In Pakistan, however, only 13% say they have confidence that the new American president will do the right thing in world affairs, the lowest rating among the 25 nations included in the study, and only a slight improvement from what Bush received last year. In fact, Pakistanis express more positive views of Osama bin Laden than they do of Barack Obama, even though views of the al Qaeda leader have grown more negative in recent years. Nearly one-in-five (18%) have confidence in bin Laden to do the right thing in world affairs. Most Pakistanis are unfamiliar with the other Western leaders included in the survey – 66% have no opinion about German Chancellor Angela Merkel, and the same proportion expresses no opinion about French President Nicolas Sarkozy. The most popular foreign leader tested is Saudi King Abdullah; 64% say they have a lot or some confidence in the Saudi monarch. Only 18% believe Obama has a better understanding of Pakistan than most Western leaders. Twice as many (36%) say he does not, and 47% do not know. Majorities or pluralities in most of the nations surveyed say that Barack Obama’s election improved their image of the United States. However, in Pakistan, only 9% feel this way, the lowest percentage among 24 countries in which this question was asked. Even in Turkey and the Palestinian territories – which often, along with Pakistan, rank near the bottom in terms of positive views about the U.S. – significant shares of the public say the election led them to a more positive opinion: 38% of Turks take this view, along with 37% of Palestinians. Pakistanis are actually more likely to say the election made them have a less favorable view (23%) than to say it led them to have a more favorable opinion. A similar proportion (26%) volunteers that the election had no impact on their assessment, while many (42%) do not have an opinion. In 2005, after George W. Bush’s reelection, the percentage who said it improved their opinion of America (10%) was roughly equal to the percentage saying that today about Obama’s win. 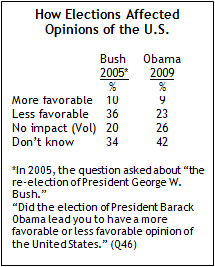 However, Bush’s victory engendered more negative reactions (36% less favorable) than Obama’s. One-in-five in 2005 volunteered that the election had no impact on their view and 34% did not answer. While expectations for Barack Obama are quite high in most of the nations surveyed, they are less so in Pakistan, where many are either pessimistic about the new president or are not sure what direction he will pursue on key foreign policy issues. Only 26% think Obama will get the U.S. to take significant steps on the issue of global climate change, while 29% believe he will not, and 45% offer no opinion. Pakistanis are more than twice as likely to say Obama will not seek international approval before using military force (36%) as to say he will (17%). As in other Muslim-majority countries surveyed (with the exception of Indonesia), few Pakistanis (17%) think Obama will be fair in his dealings with the Israelis and the Palestinians. And a 44% plurality doubt that Obama will consider the interests of countries like Pakistan when making foreign policy decisions. When asked to give an overall evaluation of Obama’s international policies, only 12% say they approve, while 42% disapprove and 46% do not have an opinion. In addition to overall evaluations of Obama’s foreign policy, respondents were asked about several specific initiatives, including policies regarding Iraq, Guantanamo, and Afghanistan. 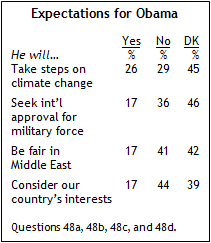 A solid majority (63%) supports Obama’s plan to remove American combat forces from Iraq by December 2011; only 8% disagree with this policy, and 29% offer no opinion. One-third (33%) support closing the U.S. military prison at Guantanamo Bay, Cuba, while about half that number (17%) opposes closing the prison. Half of those surveyed do not have an opinion on this issue. 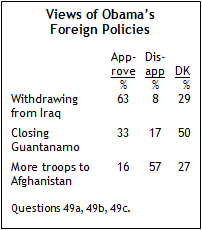 There is little support for Obama’s decision to send more troops to Afghanistan – only 16% approve. A clear majority (57%) disapproves, while 27% have no opinion. Only 8% of Pakistanis have heard that Barack Obama’s mother once worked in Pakistan. Obama’s personal connections to Kenya and Indonesia are much better known in those countries. Nearly all Kenyans surveyed (96%) have heard that Obama’s father was Kenyan. And about eight-in-ten (79%) Indonesians are aware that Obama lived in their country as a child.